I finally got to spend some time with this deck and try to figure out how to get it to work. I will definitely say that it is one of the most complex decks out there. It is EXTREMELY easy to misplay, and one wrong step could completely lose the match for you. It is also the most time consuming deck in the meta today. I had a couple of games that took WELL over a half hour on PTCGO. It’s also going to take you a couple of games to get used to playing it, it is completely different than any other archetype in the game right now. But that alone should make it worth trying out. You should play four or five games with this deck just because it will force your brain to work differently. And it is so exacting that it really forces you to play perfectly. It’s a good exercise in forcing you to play perfectly and do what you can to avoid making mistakes. And you have to do this with a clock in your head. There were a couple of games where I almost ran out of time, and one early on where I did run out of time. It takes about thirty or forty seconds to execute the whole cycle each time. Once you do get the cycle established, you have to move quickly each turn to replicate it. No lolly gagging around with this deck. You have to play as quickly as possible on your turn, and your play has to be perfect. Like I said, those factors alone make it worth your time to spend a couple of hours learning this deck. You want to have a Looker in hand and a Looker in the discard pile. This is the way the cycle works. You use resource management to move Looker to the bottom of the deck, and then the next turn you play Looker to put it back in your hand. This is the biggest danger of playing the deck: if you put all of your Lookers in the discard, you lose. This is part of the reason I added Puzzles. This way you have some options. And if you grab two Puzzles, you never have to worry about not grabbing the right cards. You only need two cards – Looker and Devolution Spray – to keep the cycle in motion. This means you will typically have an extra card – a hammer or another Pikachu or a Mt. Coronet or something else that will help you outside of the cycle itself. 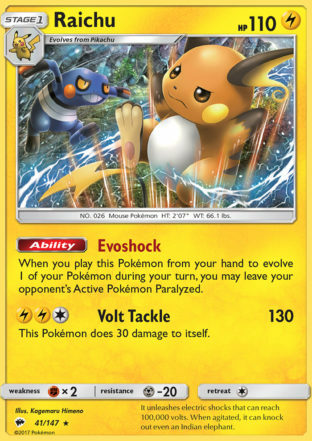 You want to have two Pikachu / Raichus out and three Orangurus on the board, and you want to put energy on all of them. This way if you get Guzma’d or N’d, you have your best chance of continuing the cycle after your opponent attempts to disrupt it. Remember that it takes thirty to forty seconds to execute the cycle. Do it fast, and do it efficiently. Think about what you want to do ahead of time while your opponent is thinking. This is not a brainless low mental activity archetype! You have to be precise and you have to work quickly. If you can, get two Devolution Sprays in hand. This way you don’t have to use Looker during a turn and can use something like Delinquent or Team Flare Grunt. You can beat Dawn Wings Necrozma or Stand In Zoroark, you just have to get them in the active position and paralyze them. Counter Catcher is HUGE in matchups against these Pokemon. Like I said, this deck is worth playing a few times just because it is SO different – it will make your brain work differently, and that’s a good thing. Just realize you might need to mute your opponent because you’re probably going to get some angry red faces. Next Post:The Best Necrozma Build? I can’t wait to try out your version! Lele is a good addition, no doubt. Puzzle of Time too, since you can retrieve these and use them to retrieve other cards as well. And I knew you’d sneak a Deliquent in there as well. My only critique is — No Gladion? What if you have 2 important cards in Prizes? In general I think this is an underrated card, especially early in the game. You get to pick 1 of 6 cards, and if you collect a prize and are lucky to get it back, you can use it again (or not knowing what’s there.) I can’t tell you how many times I needed X (rare candy, stage 2, stadium, etc.) in a critical situation and used Gladion to pick it up. I’m curious how this fares in a Buzzwole-GX heavy metagame. The same goes for Zoroark (BKT)… yes you have answers to both in your deck, but they’ve got answers to your answers as a simple matter of their popular builds; Guzma, N, and OHKOs. XP Now that I think about it, Golisopod-GX is in the same boat. Some of these also run Acerola for added complications. I hope I don’t sound too negative, but I am less optimistic than Keemonto was in the comments under Mike’s article on this. This strikes me as one of those decks that, once you know to be on the lookout for it, you learn how to beat at which point it boils down to who makes more misplays and/or has better luck.